Gusty east winds over parts of metro area have kept temperatures very mild during the night. The two MesoWest plots here show 07:00 am MST temperatures above and wind gusts at same time below. Morning temperatures, and lows during night, were around 15 F warmer than yesterday morning. Here at house it's currently in low 60s, with east wind gusts of about 25 mph. Winds at the Mt. Hopkins RAWS station were definitely above 65 mph (see previous post). Winds there gusted over 50 mph late morning yesterday, and then dropped off during the afternoon and evening and then increased to over 80 mph around midnight. Plot above shows the RAWS data since midnight. Wind rose plot at bottom is for the Kitt Peak 4-m structure and have over 50 mph much of night. High pressure over the Great Basin today helps tighten the pressure gradient for easterly winds. The 10-m wind forecast above (from 06 UTC WRF-GFS forecast run at Atmo last night) indicates strongest low-level winds around airport and metro area at about 10:00 am MST tomorrow morning. The situation sets up for the Whipple Observatory and the Mt. Hopkins RAWS station earlier, with forecasts from the same run indicating strong winds by mid-morning. Photo above shows view of the Santa Ritas from Highway 83, at about the site of the WRF-GFS forecasts for the skewT at Sonoita. The prominent gap to the left (south) of Mt. Wrightson is Riley Saddle - immediately up-wind of the observatory. 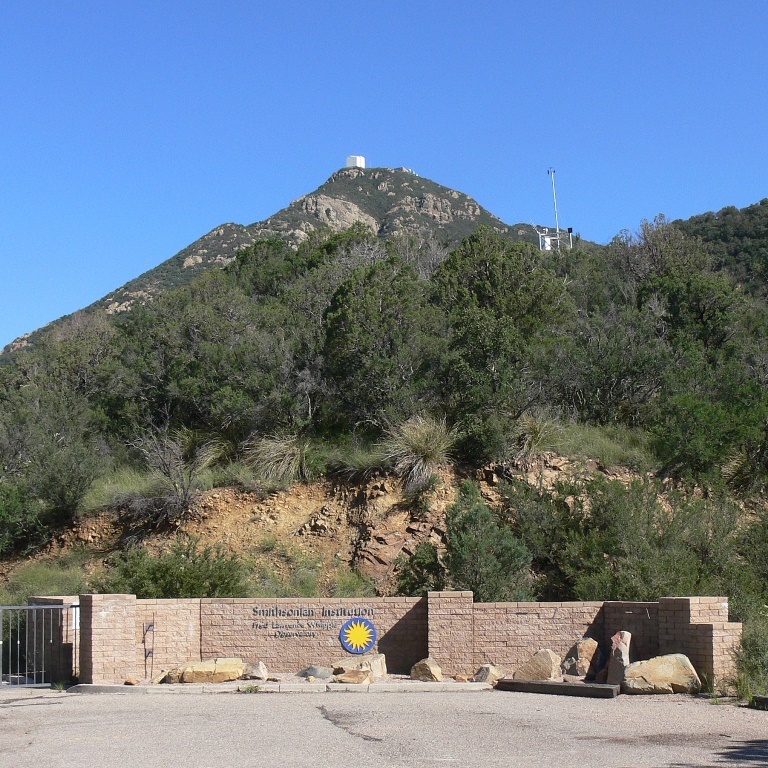 Photo below shows the Whipple MMT telescope complex at top of Mt. Hopkins, with the RAWS station in foreground at distinctly lower elevation - Winds apparently gust most strongly around the RAWS site, due to a second terrain gap upwind of the station. While yesterday's forecast kept the layer of easterly winds reaching to only about half the height of the Santa Ritas massif, today's forecasts of the Sonoita sounding indicate the layer reaching above 700 mb. SkewT above is valid at 10:00 am this morning, while forecast below is valid at 09:00 pm early tonight. The east winds weaken briefly in the forecasts during the mid-afternoon today, but increase again after dark. These soundings would indicate gusts of 50 to 65+ mph at the RAWS site beginning this morning and continuing into early morning tomorrow. The large-scale pattern continues so miserable for the Southwest, that I've had to scan Jack Hales webcam wall to find things of interest. 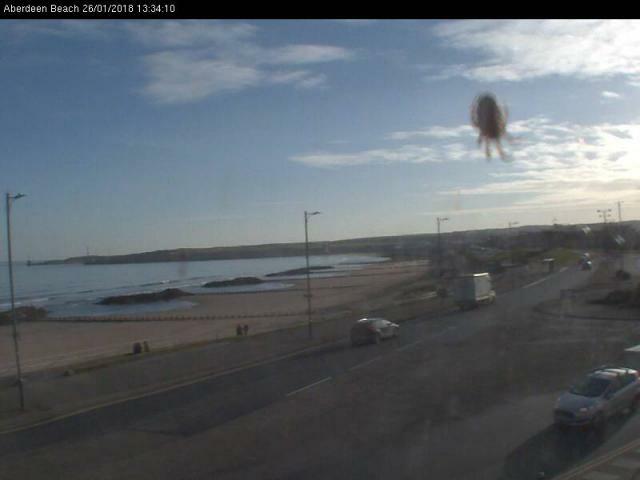 Above image (from Aberdeen, Scotland, yesterday evening) captured a little beastie crawling across the camera lens - I can only count six legs, so it's not clear what it was. 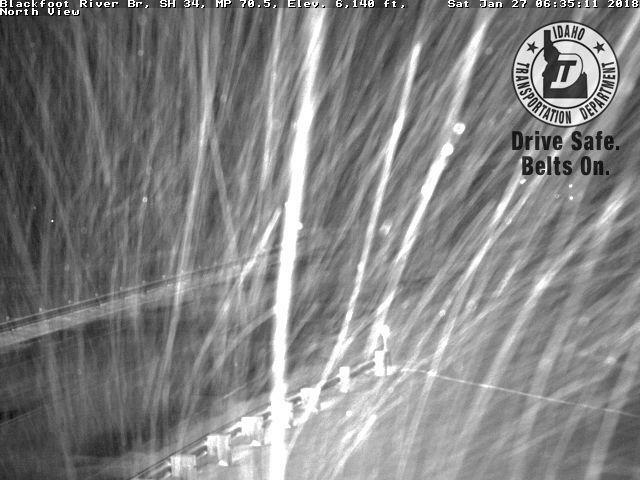 Below is an interesting, and strange, image from the Idaho Transportation Dept. that seems to indicate considerable growth between the camera and the bridge of interest. As for weather, only thing to focus on is more gusty east winds. Above is 06 UTC WRF-GFS 10-m wind forecast valid at 11:00 am tomorrow morning - appears the winds will continue on Monday. Not clear yet whether the easterlies will be deep enough to trigger strong, gap winds at the Mt. Hopkins RAWS station - will take a look at the situation tomorrow. The GEFS 500 mb spaghetti chart, out at a week from 00 UTC last evening (below), shows a bit of spaghetti over the Southwest, but that blip is very weak and likely not of significance for precipitation. The average from the GFS (left side) shows above normal heights (red) have a wide extent over the hemisphere. Meanwhile the intense low over Hudson's Bay means continued misery for much of the eastern U.S. The WRF-GFS forecast of total precipitation (from 00 UTC out to a week - second below) indicates even more widespread dryness over much of the West than did the last one I posted. 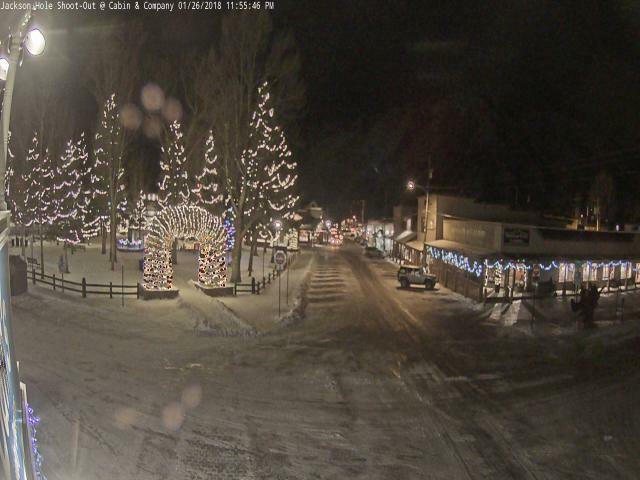 Jackson, Wyoming, looks like Christmas all winter - above. 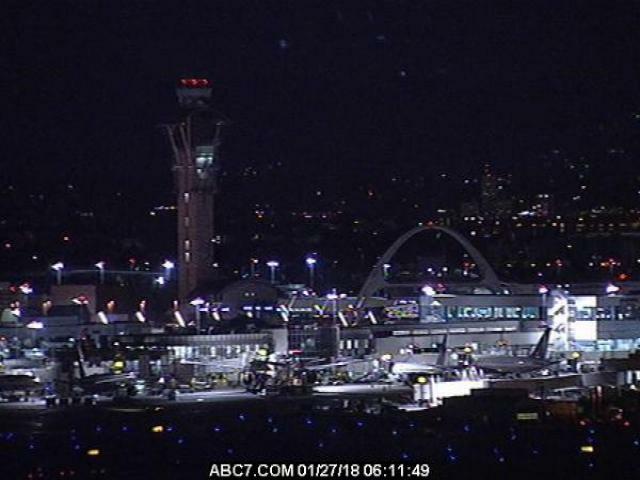 Below is shot of LAX control tower early this morning as another busy day approaches. 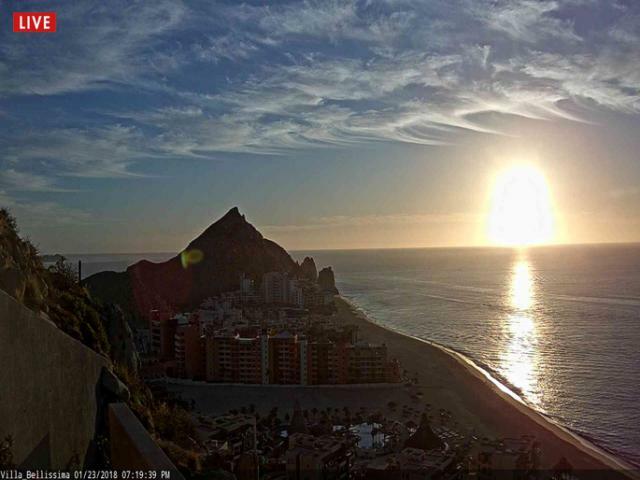 Sunrise this morning at Cabo San Lucas, Mexico, with a row of cirrus streamers (from Jack Hales webcam wall). Much milder morning today, with the east winds keeping 7:00 am MST temperatures (above from MesoWest) in 40s to middle 50s F. Very mild here along the Rillito compared to yesterday's cold. The WRF-GFS forecasts for the Sonoita soundings have apparently verified, with max gusts at the Mt. Hopkins RAWS reaching to 58 mph early this morning (below). The GEFS plumes for QPF at TUS are flat-lined out through the end of the month. However, the temperature plumes for airport show nice warming trend (above from 06 UTC forecast runs). The brief blip over the weekend occurs as a system moves across the Great Basin to our north. The GEFS spaghetti plots from 00 UTC last evening (above) look more like lasagna-noodle plots across North America, with high-index zonal flow out at 00 UTC on the 31st of January. Little spread over the U.S. even at seven days. The 00 UTC WRF-GFS forecast of precipitation though same period (below) is very grim and leaves the Southwest high and dry. Very cold morning after serious radiational cooling along the wash overnight - low here at house dropped to 20F. MesoWest plot above shows morning lows today with most of metro area below freezing. The 12 UTC WRF forecasts from Atmo indicate increasing east winds during next 30 hours or so - above forecast is from the WRF-NAM and is valid at 11:00 am MST tomorrow, the 24th. However, the forecast from the WRF-GFS indicates a significant wind event at the Mt. Hopkins beginning by evening and increasing during the night. Below is the forecast skewT at Sonoita at midnight tonight. If this forecast verifies, I would expect gusts at the RAWS site to reach 50 to 60+ mph, before decreasing during the day tomorrow. Webcam at the Mt. Lemmon General Store (above) shows a light, covering of snow up there early this morning. 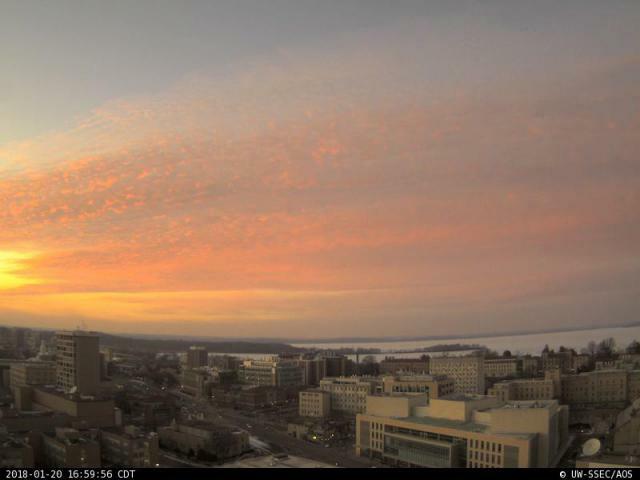 At bottom, a nice sunset yesterday at Madison, Wisconsin, grabbed from Jack Hales webcam wall. Time series of T and Td at Atmo (above) indicates distinct frontal passage around 1:00 pm MST and then another substantial drop as winds and precipitation began around 3:30 pm. Here at house the precipitation event occurred quickly from about 4:00 to 5:30 pm, preceded by very strong winds. 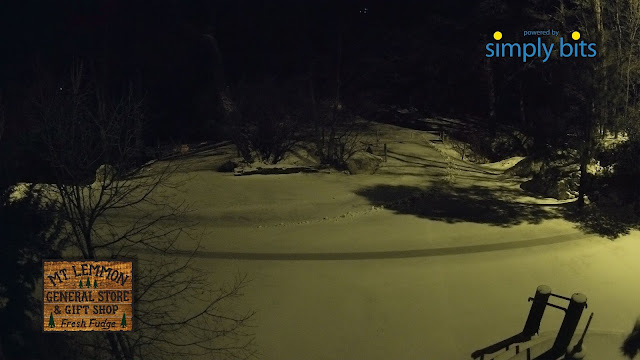 Precipitation - Here at house 0.17", TUS 0.02", DM 0.04", Atmo 0.17". Winds - 58 mph at exposed RAWS site at Guthrie, 56 mph at the 4-m telescope on Kitt Peak, 40 mph and over Pioneer Airfield, Sierra Vista, Safford, Empire RAWS (39mph), and here at house with estimate of 40+ mph. There remains little uncertainty that the approaching weather system will bring much colder temperatures for Saturday afternoon to Monday the 22nd. Precipitation amounts however remain much more uncertain wrt various model forecasts, even though event is now only 24 to 36 hours away. Above is 500 mb forecast (on 5.4 km grid) from the 06 UTC WRF-GFS run at Atmo - very cold, short wave approaching from the west at 5:00 pm MST tomorrow. Below, from same forecast on 1.8 km grid, is forecast of surface plot at 5:00 pm tomorrow afternoon. Main changes in model forecasts have been to slow down the system some, and delay the quick hitting precipitation event into late afternoon and evening. The forecast plumes of 3-hour QPF below are from the Short Range Ensemble Forecasts (SREF) viewer at SPC - from a 09 UTC run of the system of 27 members. The fast hitting (some of members forecast entire event to be over in less than 3-hours) rainfall at TUS has shifted toward 5:00 to 8:00 pm. As for amounts: the SREF mean total is only 0.03" to 0.04"; the GEFS mean is .07" to .08"; and the wetter, deterministic WRF-GFS run comes up with 0.20" at airport. So bundle up tomorrow afternoon and watch how this all evolves. 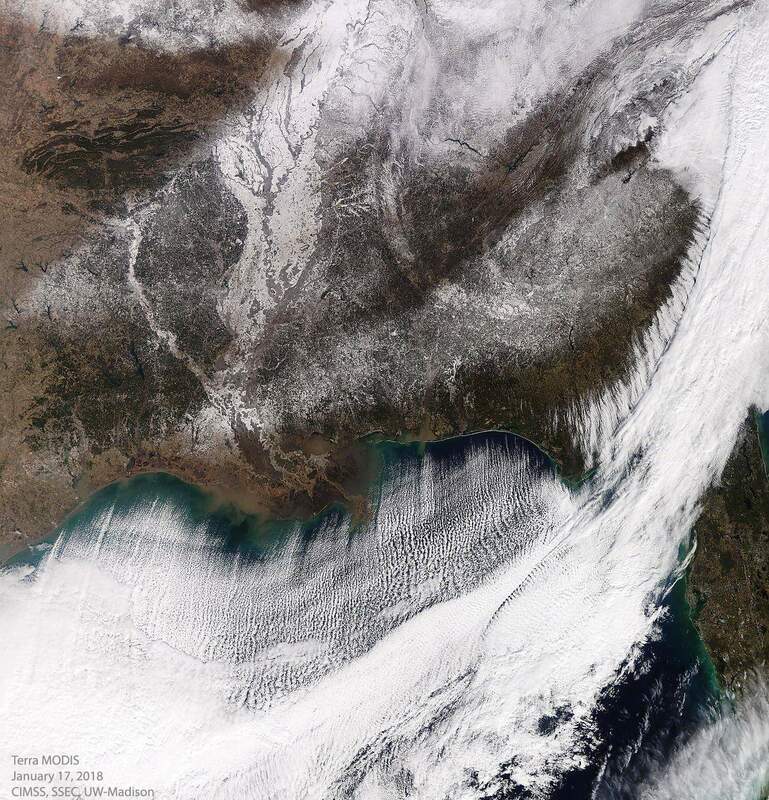 View from space of snow cover across parts of the Southeast yesterday - from the NASA MODIS satellite. Last weekend was about as nice as we can have here - light winds, clear skies, and temperatures in range 75 to 80 F. However, a strong 500 mb shortwave and attendant front will impact Tucson Friday night through Monday the 22nd. Making for a huge contrast between the two weekends. The above shows the GEFS plumes for QPF (from 06 UTC model runs) at the airport. Almost all the members forecast measurable rainfall at the airport on Saturday. Amounts have a substantial range - from 0.00 to 0.20", with a mean of 0.05". The operational GFS (blue in graph) remains very dry, with amount of only 0.01". The forecast PW plumes for TUS (below) indicate a brief spike to values around half an inch before dry air behind the front dominates. So very cold and windy for Saturday, with chance of light showers around the metro area. Forecasts of PW from the 06 UTC WRF-GFS (on 5.4 km grid) at Atmo are for 11:00 pm MST tomorrow (above) and 5:00 am on Saturday morning (below). A weak atmospheric river moves southward along California coast, but weakens rapidly once it passes Point Concepcion. This means another in a series of moisture-starved events for southeast Arizona. Graphic at bottom is from 00 UTC run of the WRF-GFS on the 5.4 km grid for total precipitation through 5:00 pm on January 20th - indicating very little for Arizona and New Mexico. Backdoor Front Here and Misc. First - a cold, blue norther has plunged south across the Southern Plains and into the lower Mississippi Valley this morning - surface plot above is from 6:00 am CST. Webcam photo below shows I-20 at Shreveport, Louisiana. School closings galore, as well as hazardous travel conditions with novice ice-drivers spinning all directions. Here in Tucson a backdoor portion of the Plains front is impacting our are with east winds and mild morning temperatures. The surface plot above is from the 06 UTC WRF-GFS and is valid at noon today. Temperatures will be down about 10 F relative to midday yesterday. Plot below, from same model run, shows the forecast winds for noon today with some low-level gusty east winds. As always, the east winds , along with some clouds, makes temperature forecasting here very difficult, especially for morning lows. In the longer term, the WRF GEFS ensmbles forecast a strong, 500 mb short wave to cross the state Friday and Saturday. The attendant cold front knocks TUS temperatures way down - above T plumes from 06 UTC GEFS - late Friday (corrected) through Monday the 22nd. The WRF-GFS forecast of precipitation through 5:00 pm (below from 00 UTC model run on 5.4 km grid) continues our dismal spell of mostly dry weather. This forecast is driven by the operational GFS, which is almost the driest member of the GEFS. The plumes for QPF show some chance for light showers as the front approaches and moves by. First Rain Of 2018 Out On Horizon?